Open to public (with admission to Garden). However, a printed invitation (above) will allow a free entry on the day of reception. Please, click HERE to print. Painting demo-stations, lecture on the direction of contemporary ink painting, refreshments and more. Art will be for sale. 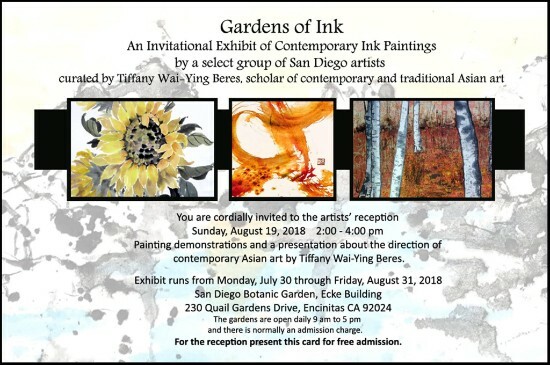 This is an invitational exhibit of Contemporary Chinese Ink Painting curated by Tiffany Wai-Ying Beres, a scholar of contemporary and traditional Asian art. Gardens are places to explore the relationship between nature, culture and place. Over the centuries, Chinese, Japanese and Korean poets and artists have imbued a variety of plants and animals with auspicious meanings and scholarly virtues. Paintings and texts are inspired by the resilience and beauty of nature’s flora and fauna. This exhibition presents a selection of contemporary ink paintings inspired by the evocative and emotive qualities of nature. Artists were asked to select flowers, birds, fish, insects, or landscapes as their principal subjects but to build upon the literal representation to find deeper layers of meaning. Planting ideas as the seeds of this garden, artists are asked to find a different way of approaching these traditional subjects; whether it is the addition of a poetic colophon, experimenting with different kinds of ink representation, adding additional mixed media, each work should have a personal resonance with the artist. By finding an idiosyncratic stylistic approach, each artwork offers a unique take on a shared theme: a celebration of the natural world. Click on the link above for full line up of events and participants! 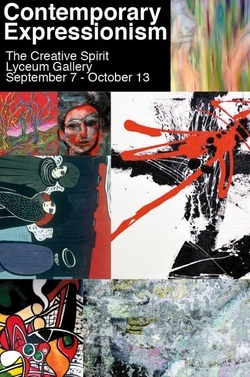 Please follow the link under show title above to visit online exhibition. The San Dieguito Art Guild, a non-profit group that celebrates its 50th Anniversary this year, hosts their 2015 Mother’s Day Weekend Art, Garden & Studio Tour. May 9 and 10, from 10am to 4pm each day. Tickets are good for both days and homes may be re-visited. 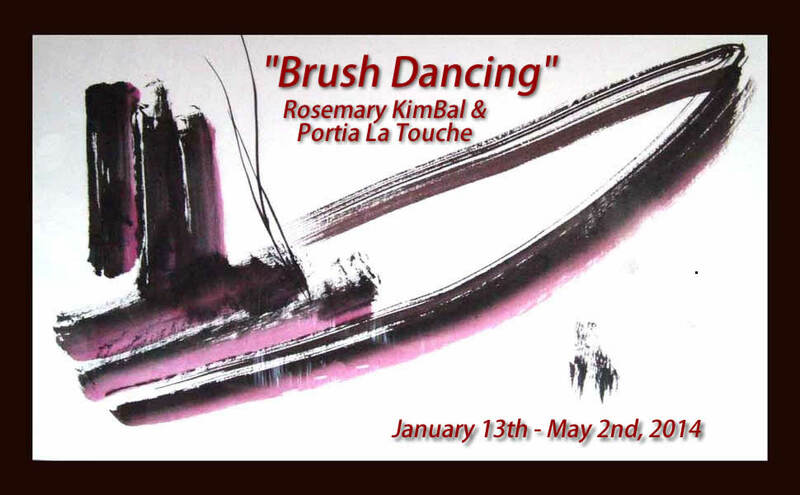 Rosemary KimBal's Studio Dancing Brush will be a part of the tour this year. You can also buy tickets at any location the weekend of the Tour! RSVP for opening reception on Facebook or just come! In conjunction with the play A Weekend with Pablo Picasso, the San Diego Museum of Art Artists Guild presents the juried exhibition Contemporary Expressionism: The Creative Spirit at Lyceum Gallery, San Diego, California. Often focusing on the internal world of emotion and spirituality, or on identity and protest, Expressionism has many faces. This exhibition seeks to explore the many different approaches to this fascinating form of art-making. The term Expressionism was first applied to the Parisian painting that followed Post-Impressionism at the turn of the 19th century. Throughout the 20th century, Expressionism was applied to various figurative and abstract movements, from the German Expressionists, to Picasso and the Cubists, to Abstract Expressionism, Art Informel, Bay Area Figuration, and Neo-Expressionism. Eleven of Rosemary's paintings are available for viewing at US Bank, Encinitas. You are welcome to stop by and take a look of this nice collection, including Boat to Heaven (pictured), Giant Bamboo and Zen Circle. The exhibition/silent auction of these works has been a vital part of our 10th. 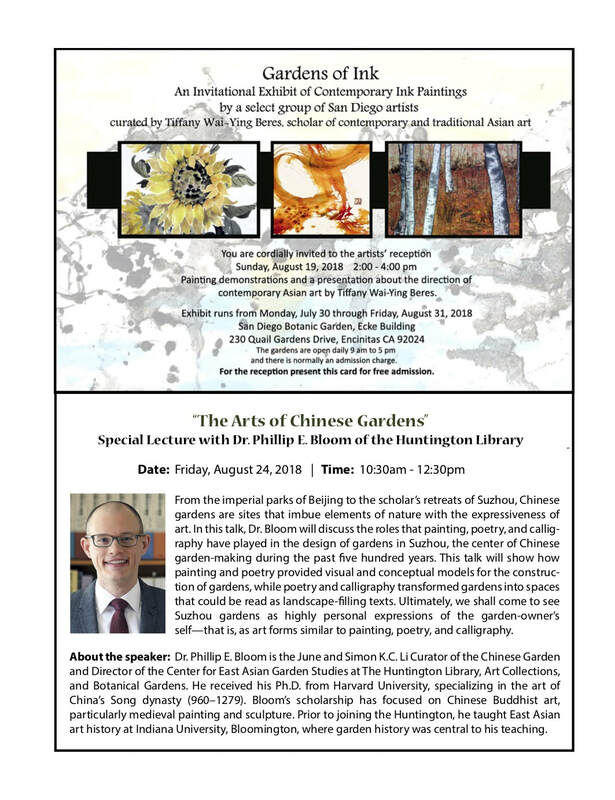 Anniversary Celebration in partnership with San Diego Visual Arts Network. Feeding America SD 9455 Waples Suite 135, San Diego, CA 92121 and will include the Blanks 2 Beauty Exhibition/Silent Auction (9:00p.m. ), fabulous live music, by Ruby and the Redhots, D.J., delectable desserts, no host bar, performances and much more. Entry to the Celebration will be free for all B2B participants. The theme this year for B2B is “A TASTE OF BEAUTY”. All proceeds benefited Synergy’s arts educational program with Kimbrough School children in collaboration with Feeding America SD and Young Audiences. Rosemary KimBal and Portia La Touche hosted one of VIP "TABLE-TOPs" DISPLAY "Zen of Cuisine." Celebrate Asian Brush painting by Rosemary KimBal and Portia La Touche at the Artist's reception. Light snacks and wine will be served. 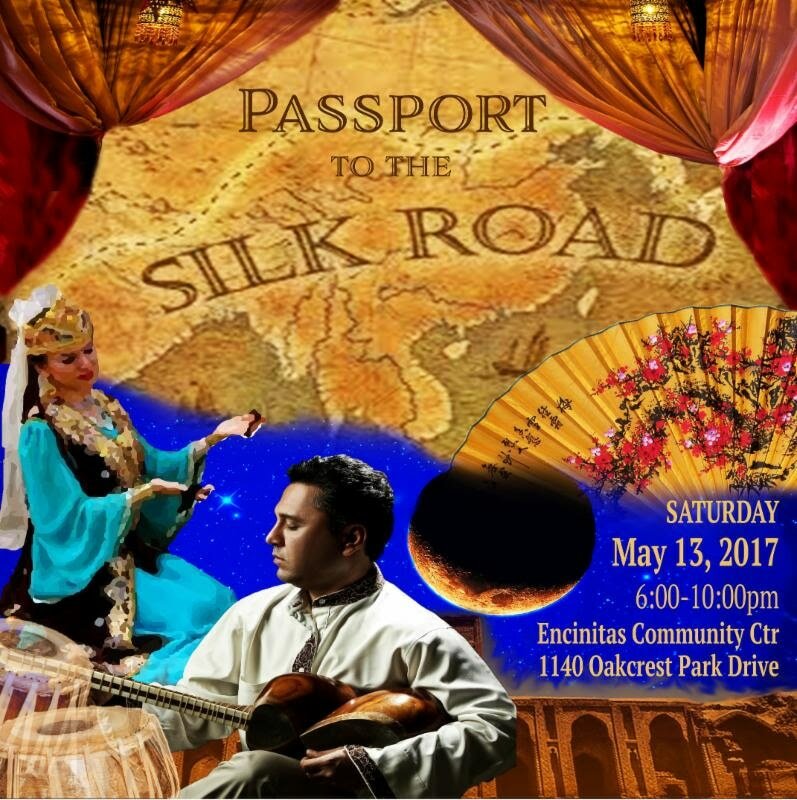 Special treats: Jayne Moulton will be teaching the art of making spring rolls, Gordon Ma will offer seal carving on the spot, Portia La Touche will be demonstrating Zen Painting and Rosemary KimBal will offer Chinese Horoscope and/or mini Face Reading consultations. It is destined to be a fun night! 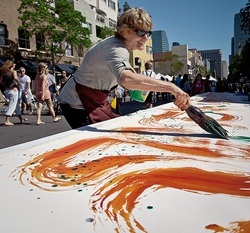 Two San Diego artists, Rosemary KimBal and Portia La Touche, have passed on the tradition of Brush Painting in the Asian Manner from Master to Pupil and created a body of Contemporary Zen Art and a legacy which is carried forward from one generation of artists to the next. The intention of this exhibit is to express the importance of learning from the past, as is the practice in traditional Contemporary Zen Painting, and then once skilled, leaping forward to define one’s own way. Our art embraces the essence of Zen, and then we have made it our own by adding a contemporary inspiration. This is a beautiful, meditative art form to be enjoyed on many levels – visceral, spiritual, or simply visual. In business we learn from the successes of others, but in the end we must create something new that is our own. This exhibit is our way of illustrating the process of passing on passion and skill from Master to Pupil to inspire others to create their own legacies – in business and in art. Please, join us for wine and appetizers and meet the artists! RSVP using the form below the invitation. Thank you! 13, 2012 through December 31, 2012. You are invited to join Rosemary at the Oceanside Museum of Art for a creative happy hour from 6:00 - 9:00pm. Watch art come to life as the artist produces an original artwork in front of guests. 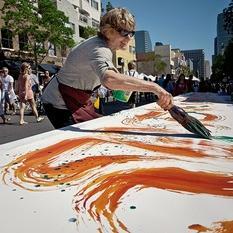 Don't miss this opportunity to engage with an artist and try painting with a giant brush! Enjoy complimentary appetizers by Bull Taco and an open beer and wine bar featuring craft beer from Lagunitas Brewing Company. "Dancing with the Stars!" San Diego style - THIS WEEK ONLY! Come see me dance with the company dancers in this performance that marries story, visual, live music and dance. And I was just taking a dance class..."
14th St. and C St.